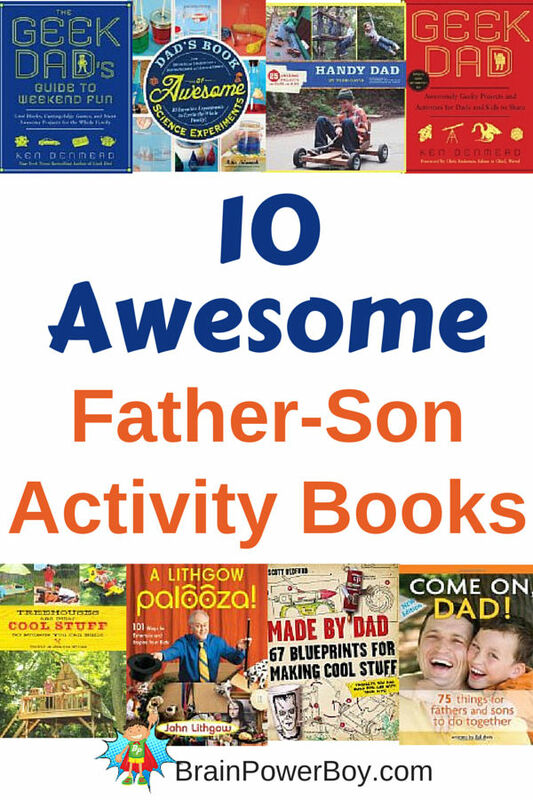 Today we rounded up the best books for boys on activities for fathers and sons. These books can certainly be used with brothers, uncles, grandfathers or the whole family but since this is our Father’s Day post, these were picked with Fathers and Sons in mind. The father-son bond can have a big impact on a boy’s life. It can also have a big impact on a boy’s learning life. Fathers who take the time to learn with their boys, show them how to do new things, and allow their boys to see them learning and enjoying the process of trying and sometimes failing, are giving their boys a great start in life. These father-son activity books focus on doing, making, and trying new things. Your guys will find a lot of awesome things to do together. 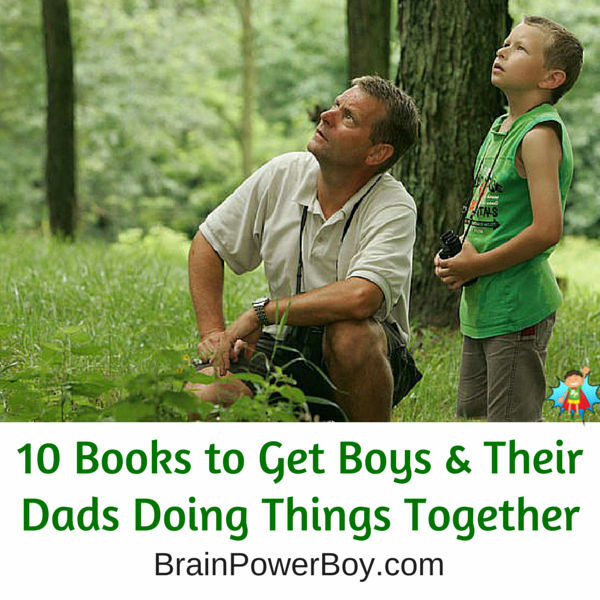 A Boy’s Summer: Fathers and Sons Together is a nice book with many old-fashioned suggestions for things to do. Make a whistle, a slingshot, or a fire. Weave a basket, catch butterflies, become a poet. As you can see the selections are varied. I like the book as a guide for ideas of what to do while spending some time together. You may need to add to the instructions for some of the projects as it is a bit light in that area. Come on, Dad! : 75 Things for Fathers and Sons to Do Together is for boys 4-8 and their dads although all ages would enjoy some of the activities. There is everything from very simple ideas like making a milkshake or a personal pizza together, to water fights and oobleck, to family tributes, learning about money and writing letters. Good selection of activities for boys and their dads. If you have some builders on your hands you could get Treehouses and other Cool Stuff: 50 Projects You Can Build . Some of the projects are very difficult and others are easy to build. The book has a small center section with color photos and the other images are drawings. We like the nature hut and the model sailboat and feel those are doable for us. Some of the projects such as the tree houses and the playhouses are obviously much more detailed. Handy Dad: 25 Awesome Projects for Dads and Kids is a neat book that is well done. The directions are clear and the projects are fun! Easier ones that we think boys will like are a water-pressurized rocket and the slingshot (nothing quite like making your own.) There are also zip lines, a half-pipe and a go-cart. Pretty cool stuff. The projects in Dad’s Book of Awesome Science Experiments: From Boiling Ice and Exploding Soap to Erupting Volcanoes and Launching Rockets, 30 Inventive Experiments to Excite the Whole Family! (crazy long title, eh?) are broken down into sections–chemistry, biology, physics, earth and the human body. We like this one because the experiments are easy to do, don’t take a whole lot of specialty items and are very hands-on and interactive. Great for boys and a busy dad to do together. Many of the ideas here are pretty basic such as coke rocket, rock candy, egg in a bottle etc. but what is nice is having them all in one place with good pictures and instructions. The Geek Dad Series of books has some very engaging things to do. I wish they were full-color books with pictures but alas they are not. However, I will forgive this omission because the books are pretty awesome. The ideas presented will keep many boys and dads happy for a long, long time. There are three books in the series so take a look at each of them to see which would be the best fit for your guys. Geek Dad is our favorite and highly recommended. They also have The Geek Dad’s Guide to Weekend Fun which has some neat ideas and The Geek Dad Book for Aspiring Mad Scientists. This one is different. A Lithgow Palooza! has a lot of very interesting and unusual things to do. Some are still hands-on but some are more about thinking and playing. There are things in here that I have never thought to do with my son but that I like very much. We love words and there is a whole section on words, another on music, one on dance, animals, vacation, art, holidays, food. See? It is different–but very good. If you have a boy that likes the things above, give this one a try. I think it will make for some fun times. I hope you found some great books that lead to fathers and sons spending time together. These make wonderful Father’s Day gifts but are also great for any time. These books will get them trying new things and creating together. Let’s get those boys and dads spending time doing something that will create a strong bond and wonderful memories. If you enjoyed this book list try our other books that boys will like lists (don’t miss our book list for mother and sons!) For more activity ideas for boys and their dads see activities for boys. Here are a couple of other Father’s Day Post from my friends. Stop by and say hi! Whether you’re looking for Father’s Day crafts, traditions or recipes the Super Mommy Club has got you covered! Thanks for the nice comment Lily. I appreciate you stopping by. Glad you like the books. Love these ideas! It’s tough when dad has to go to work all week so the time they spend together needs to be more special I guess – I’m adding these to my Amazon wishlist to refer back to. You always have the best books for boys ideas!